Search will not work with scripting disabled! 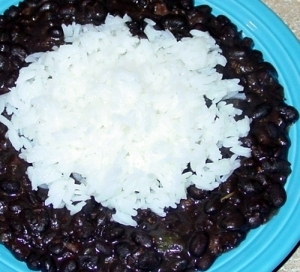 This is pretty much the classic recipe for Cuban Black Beans and Rice. Black Beans with Rice is a peasant dish. The traditional dish gets its main flavors from onion, garlic, bell pepper, pork fat and, of course, the beans. I've changed the recipe a little, using bacon instead of just pork fat. This recipe also has bouillon cubes, an orange, a little cumin, black pepper and oregano, which are found in many versions of this dish. Other recipes you might like are Red Beans and Rice and Hoppin' John. Rinse and sort through the dried black beans in a colander, making sure there are no small stones, dirt, or bad beans. Put the beans in a large pot, and cover with water, and bring to a simmer. While waiting for the beans to come to a simmer, finely chop the bacon and cook slowly over low heat in a large covered pan until lightly browned and crisp. Add the bacon to the beans, using a silicone scraper to get all the bacon fat. Stir into the beans. Cut the orange in half and remove any seeds. Juice the orange and reserve the juice. Add both halves of the orange to the beans. Add the onion, garlic and bell pepper, stirring into the beans. Add the bouillon, oregano, cumin and black pepper to the beans, stirring well. Once the beans come to a simmer, cook them for at least an hour and a half, stirring occasionally. Remove the orange halves and discard. Continuing cooking, stirring occasionally, until the beans reach the consistency that you desire, this may be another one to two hours. Remove the beans from the heat, stir in the reserved orange juice. Add salt to taste. These beans can be served as a side dish to go with other foods, like ribs, or they can be used as a main dish. When using as a main dish, serve the beans beside an equal portion of a nice white long-grain rice. I like to use Jasmine rice because it cooks up to be a nice bright white color and has a flavor that goes well with the beans. Garnish with a few sprigs of cilantro or parsley. A nice salad of baby spinach leaves, avocado, red onion, mango, and a lime vinaigrette will go well with this. This site is protected by copyright and trademark laws under US and International law. © 2002-2019 M. Craig Weaver All rights reserved. My opinions are not regulated by any recognized authority - I am neither competent nor authorized to dispense advice of any kind. It is probably best to ignore me.